This is the manual for Boing Kit. Boing Kit provides various workflows to add bouncy effects to objects. Each work flow involves adding specific components to objects (explained below). For Unity 2018.1 or newer versions, Boing Kit utilizes Unity’s job system to take advantage of parallel processing across multiple CPU cores for better performance. Mouse-over a component’s parameter to see a tooltip for more detailed explanation. 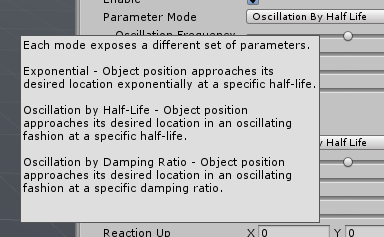 Add the BoingBehavior component to an object to apply bouncy effects in reaction to change of the object’s transform (position and/or rotation). Modify the object’s transform as usual, and with the addition of the BoingBehavior component, bouncy effects will be applied to the object’s transform. The BoingEffector and BoingReactor components are used to create bouncy interaction between objects. Add the BoingEffector component to objects meant to “push” others around in a bouncy fashion, and add the BoingReactor component to objects meant to be “pushed” around by effectors. The BoingReactorField component adds a grid of cells that react to effectors just like regular reactors. The reactor field is a tool to optimize situations where large amount of reactors are needed: each cell reacts to effectors, and samplers are used to interpolate each cell’s results to apply to objects. Depending on whether the reactor field is running in CPU or GPU hardware mode, add BoingReactorFieldCPUSampler or BoingReactorFieldGPUSampler to objects meant to react to effectors through interpolating cell results from the reactor field. CPU samplers apply bouncy effects to whole object transforms by interpolating results from reactor fields once per reacting object. On the other hand, GPU samplers apply bouncy effects to each vertex of each reacting objects through vertex shaders. Objects with GPU samplers also need to have a accompanying material with Boing Kit support. Boing Kit already comes with shaders modified from Unity’s standard shaders. To make custom vertex shaders compatible with Boing Kit, include BoingKit.cginc in custom vertex shaders and call ApplyBoingReactorFieldPerVertex or ApplyBoingReactorFieldPerObject functions to sample from reactor fields (see the Custom Shader example that comes with Boing Kit to see how it’s done in practice).